Don't just think of us as your crane people. 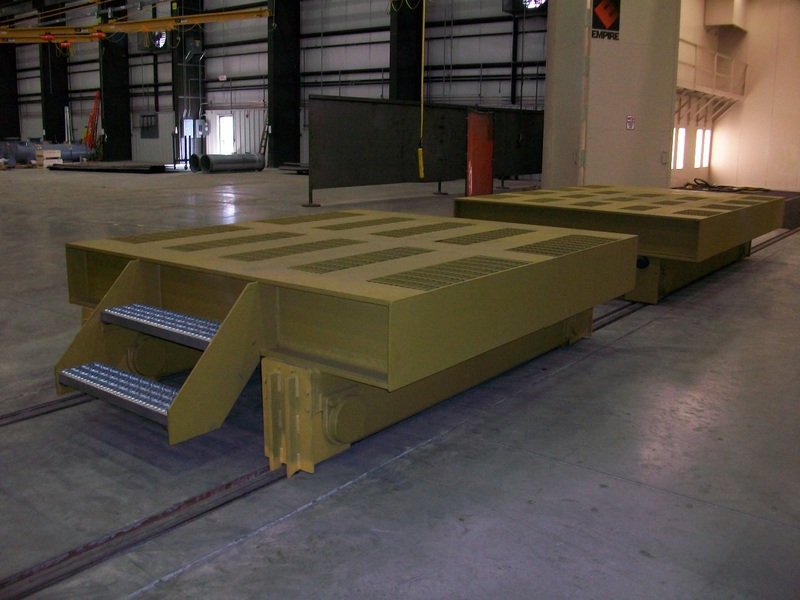 We can provide custom engineered solutions for almost any material handling need, including transfer cars. We had the opportunity to work with a manufacturer who was installing a new media blast booth. Sometimes, their product that they had to blast could be up to 40' long so they needed a solution that was adaptable to almost any need. The result was a pair on transfer cars rated to 40 ton each, 80 ton combined load. One car was motorized and the other was an idler. We provided an adjustable link bar between them so that the center distance could be easily change to accommodate the part that they had to blast. The motors and gearboxes were protected with 1/2" plate so it was rugged enough to hold up to the harsh environment while the motor controls were remote mounted. A radio control was provided which allowed the operator a safe and easy method to move the cars in and out of the booth.